Automate mouse clicks, movements & keystrokes. 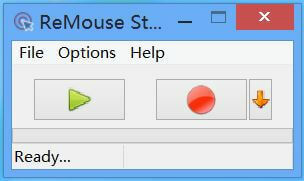 Click Recording button to record keyboard and mouse actions. Click Stop button or press the Hotkey to stop recording. Click Playback button to replay recorded actions. ReMouse is a automation program that lets you record and play back a series of keyboard and mouse actions, and saves operation records as script files for later use. It is as easy as the music player, there is convenient graphical interface to customize the configuration, and no need for programming experience. Perfectly compatible with Windows 7, Windows 8, Windows 10 and 64-bit systems. Copyright © 1997-2018 AutomaticSolution Software. All Rights Reserved.